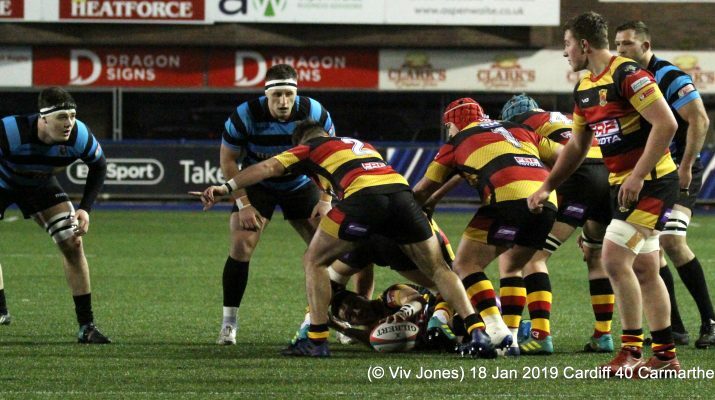 Cardiff gained a bonus point win against Carmarthen Quins on Friday night but were made to really work hard for it. And the Blue & Blacks started the game as they have the previous three league games, by giving their opponents a head start. The Quins were ahead through a penalty by Aled Thomas, and went further ahead when a break down the wing saw Torin Myhill put Steffan Marshall over. When Thomas added another penalty there was already a mountain to climb. But climb they did. Gareth Thompson got the scoreboard going with two penalties and was instrumental in Cardiff’s first try. His break from off the top lineout ball cut a huge hole through the Quins defence, Tom Williams was on his shoulder to finish the move under the posts and Cardiff were level. On the stroke of half time the outside half landed his third penalty to send the home side in 16-13 ahead. The second half was a lot better from the Blue & Blacks, although it took a while to see off the Quins challenge. The set piece, which hadn’t been working at all in the first half, started to get going and when a rolling maul close to the Quins line was driven over Morgan Allen was last up with the ball for a try that Thompson converted. The Quins were now being trapped in their own half by the solid Blue & Black defence and the threat they had posed seemed to be fading. It was now down to Cardiff to go in search of the bonus point win, and when a beautiful break by Ben Thomas and a well-timed pass to Jack Roberts saw Cardiff score try number three the challenge was on, but with only a few minutes left to play it looked unlikely. A mistake though from the Quins put Cardiff back on the attack and with the clock in the red they were awarded a scrum five metres out. The first shunt saw the Quins pack scatter, but only a penalty awarded. The second reset went straight to ground, but when the third attempt saw Cardiff go straight through the Quins again the referee had no option to award a penalty try and Cardiff had their bonus point win to move to second place in the table.